As most of you probably know, when Apple announces a new product, as it did earlier today, the online Apple Store goes offline. Back when online sales first began, this was the norm and you’d see it all the time. Today, though, Apple is the exception rather than the rule. Imagine if the Amazon store went offline for two hours whenever an existing product was being replaced by a newer model. Or if Dell’s store or HP’s store did the same thing. It just doesn’t happen; product updates are done while the store is still online, so that customers will never be turned away due to a closed store. After all, the “buy anytime” mantra is part of the allure of online shopping. Every Mac fan is probably familiar with the large yellow sticky that replaces the actual store during these announcements. Some like it and some hate it—I have a friend who has a Photoshop-customized version that reads “We’ll be back someday ,” and that becomes his iChat icon during the rollouts. Personally though, I like it, and think it’s a good thing that Apple’s store works this way. So why do I think a closed store is a good thing? I think it’s a good thing because it helps with “the buzz” around new product announcements. Since Apple is so secretive with their product plans, nobody ever knows what’s coming, or when (AppleTV and iPhone excepted). And so, when you go to check the store some day and find it closed, well, your pulse rate goes up and your iChat windows fly open: “What could it be?” “I bet it’s the new ultra-portable Mac!” “No, it’s the Beatles iPods!” “No, you’re both wrong, it’s a new tablet Mac to take it to those ModBook folks!” “No, you’re all clueless—it’s the new widescreen video iPod with touch controls!” So instead of the store’s closing being a negative event (“Apple store offline for several hours this morning”), it turns into just the opposite: an event that helps Apple build and maintain the buzz around its products. Sure, sometimes the end result turns out not to be worth the buzz build-up—today’s modest MacBook revisions would be a perfect example of that—but many times, it is. When the store reopens, there’s a palpable sense of excitement as you go looking for the new products, and then discuss everything you’ve found with your friends and coworkers (at least here in this Mac-centric business). It’s a few minutes of exploration and interest to jazz up the routine of the day. I honestly believe Apple could update their store in real time if it chose to do so, though it might require additional investment in engineering, software, and hardware. However, I don’t think it needs to do so, as it’s not like Apple customers are going to go elsewhere to buy just because the online store is down. Even if you do go buy your Mac from another online merchant or physical store, Apple really doesn’t mind—it’s not like someone choosing to purchase an HP instead of a Dell because the Dell store was offline when they were ready to buy. If a Dell prospect is turned away by a closed store, there’s a chance they may choose to purchase a competitor’s machine. But in Apple’s case, Apple still gets the customer, though that customer may come through a partner instead of going direct to Apple. 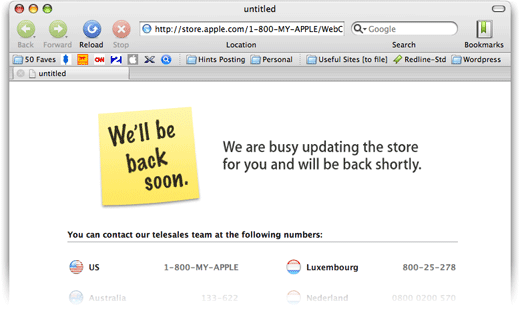 Given the positive buzz the online store’s closing generates, and the minimal impact it has on Apple’s customers and potential customers, I hope Apple doesn’t change this practice. I for one will never tire of seeing the “We’ll be back soon” sticky on their online store!